ST DUTHUS U17s recorded an impressive win against fellow Highland League North contenders Rothes this afternoon - and kept a clean sheet into the bargain. Just five minutes into the match, St Duthus were handed a brilliant opportunity to open the scoring when referee Eddie Nichol awarded them a penalty. The spot kick was the result of a foul committed by the Rothes 'keeper, who was ultimately booked for his trouble. The kick, though, was sent over the bar. In the Saints goal, Aneek Khan impressed with an excellent double save moments later, thwarting Rothes' attempts to capitalise on a quick counter attack. With play being fiercely contested in the middle of the park, it ultimately took a piece of magic to break the deadlock after 35 minutes. Collecting the ball 25 yards from goal, Nathan Corbett netted his fifth goal of the season with a stunning top corner strike to give St Duthus a deserved lead. Having been introduced at the half time break, Keir Carson made his presence felt and will feel unlucky not to have scored with an hour gone after dinking the ball just over the bar from close range, getting on the end of a cut back. Moments later, Aiden Stainke only narrowly missed the target with a shot that flew just over the crossbar. The game was put beyond the reach of Rothes with ten minutes to go. 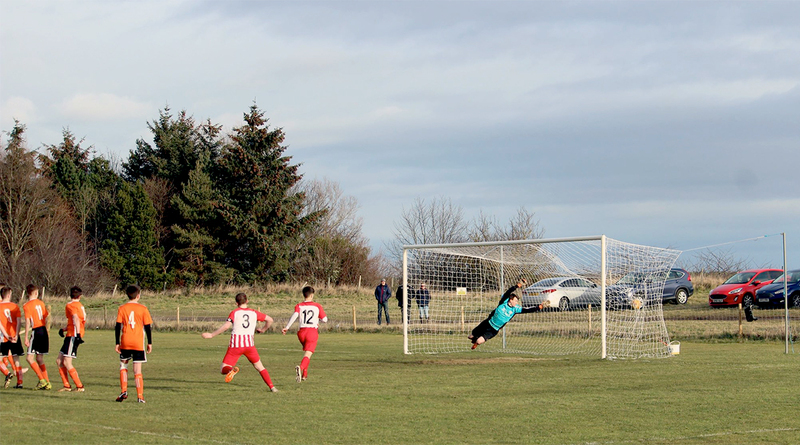 A wreckless clearance just outside the box, which ultimately led to the Rothes substitute goalkeeper also being booked, handed Saints a free kick opportunity and Scott MacIver made no mistake with a finely placed effort to make it 2-0.